Update: We've added more Snapdragon 845 (likely Samsung Galaxy S9) vs Apple A11 (iPhone X) benchmarks to in-depth testing of this new chipset. The Qualcomm Snapdragon 845 is the small, but powerful chipset expected to be at the heart of some of the best Android phones in 2018 – and now we know just how powerful it will be. 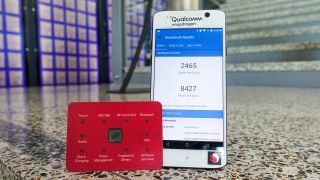 We tested the performance of the Snapdragon 845 inside a reference device at Qualcomm’s San Diego headquarters last week, and we were able to run several independent benchmarking tests. This gives us an idea of how far the chipmaker will be able to push Android phones. While we could also see the new 845 chip inside tablets, laptops and IoT devices in the future, it’ll get its start in the next round of flagship smartphones. Here’s how it fared in our tests, and why it’s shaping up to be such a big update. Your next Android phone could be supercharged by the Snapdragon 845, according to our benchmarking tests. It managed to carve out a Geekbench 4.0 multi-core score of 8,427, the highest we've seen yet on a phone running Android 8.0 Oreo. That's more than 30% faster than last year’s best phones with the Snapdragon 835, and, importantly, more than 27% faster than the new Huawei Mate 10 Pro running Huawei’s own Kirin 970 chipset, according to our Geekbench results. While TechRadar primarily tests new chips through Geekbench 4.0, we did run a number of different tests using Antutu and a few web-based apps, and we got similar results. The Antutu score was 256,206 on the Snapdragon 845 reference device vs 177,423 on the Mate 10 Pro. That extra power is important for more weighty applications, such as 3D gaming, VR and AR. Expect less wait time when recording and editing videos on your smartphone, too. And while today's current phones handle tasks just fine out of the box, high-end chipsets can be especially desirable if you plan to hold on to your device for more than one or two release cycles. Buying a phone with the Snapdragon 845 inside should give you an edge if you’re looking for a powerful Android handset in 2018. There’s nothing faster among Google-based phones – yet. There’s room for competition from both new and existing chips. We haven't yet been able to benchmark Samsung’s Exynos 9 Series (9810) chip, which is slated for the Samsung Galaxy S9 and S9 Plus later this month everywhere but the US. In the US, Samsung will almost certainly use the Snapdragon 845, so expect a lot of performance and feature parity between the two chips (even if Samsung’s chip usually maintains a slight performance edge over Qualcomm's chip). There's very little daylight between the two. There are, however, three phones that currently outperform the Snapdragon 845, and all three come from Apple: the iPhone X, iPhone 8 and iPhone 8 Plus. iPhone chipsets are built differently, of course, which is why we ended up with Geekbench multi-core scores of 10,249 for the new Apple handsets (all have the same A11 Bionic chip inside). We did find that the Antutu benchmarking app gave the Snapdragon 845 a score of 256,206, which led the iPhone X 11 Bionic at 228,360. We've found more reliability from the processing power of Geekbench over Antutu, however. The raw benchmarking scores prove that Qualcomm is looking to take the chipset crown among Android phones for now. But what does that all mean? What are the phones we're likely to see the Snapdragon 845 in, and what are the specs and features we're likely to see in those phones? The first Snapdragon 845 phones launch this month, and while the exact lineup hasn’t been confirmed, we’re fairly confident we’ll see it in the US versions of the Galaxy S9 and S9 Plus. Samsung is helping Qualcomm manufacture its latest Snapdragon chipset, so it may again be first in line to get the chipset in its phones. And sure enough we were told that we'll "probably see announcements at MWC 2018" by Alex Katouzian, Qualcomm's SVP of its mobile business. The timing is perfect for Samsung’s February 25 launch event in Barcelona. From there, we can expect to see a slew of other new releases sporting the 845: the LG G7, Moto Z3 Force, Google Pixel 3 and the ZTE Axon 9, among others. Qualcomm loves to boast that last year's Snapdragon 835 chipset is now in over 120 devices, from the tried-and-true Samsung Galaxy Note 8 to newcomers like the Essential Phone. With the exception of Huawei, Apple and Samsung (outside of the US), expect every other flagship phone-maker to use this chipset. There’s a lot going into the Snapdragon 845, so it’s important to know the specs of the chip and also the configuration of Qualcomm’s reference design – not all phones with it will have the exact same internal specs. Here’s the geeky stuff: The Snapdragon 845 contains an eight-core Kryo 385 CPU with a clock speed of up to 2.8GHz. Its graphics chip, the Adreno 630 visual processing subsystem, is 30% faster at graphics rendering, but also 30% more power-efficient in this generation, according to Qualcomm. Cameras should get a big upgrade via the Spectra 280 Image Signal Processor that’s onboard the chipset. It’s possible to control up to seven different cameras, according to the specs – just in case phone-makers shoot beyond three cameras and go straight to seven (they probably won't, but the capability is impressive). Even more exciting are the possibilities for recording HDR video, which we’ll touch on later. Also embedded on the 845 chipset is a cellular modem, the Snapdragon X20. This has a peak download speed of 1.2Gbps and peak upload speed of 150Mbps. It's a step toward the 5G future that both Qualcomm and carriers are eager to roll out to devices in 2019. Qualcomm’s 845 chip reference handset contained 6GB of RAM, a 5.5-inch LCD display with a 2.5K resolution and a pair of Sony-made cameras – the IMX320 and IMX386. Since Geekbench scores can very between devices, and even in individual tests, it’s best to take these specs into account – not every Snapdragon 845-powered phone will have 6GB of RAM, for example. However, while results may vary from phone to phone based on the specs, the general performance upgrade should be consistent. Your next smartphone won't just be able to display brilliant-looking HDR video, it will be able to record in HDR, too, according to Qualcomm. For that reason alone, the new Snapdragon 845 chipset is enough to make anyone who records video on their smartphone excited in 2018. Starting with a completely redesigned image sensor processor, the chipset is poised to pave the way for users to capture HDR footage on a phone camera. It can also record 4K Ultra HD at 60 frames per second. "The videos you capture are going to be more lifelike than they were before," says Tim Leland, Qualcomm Vice President of Product Management. "We're going to see an increase in the quality of pixels, not just the quantity of pixels." Just as the Snapdragon 800 was the first chip to capture 4K video in 2013, the 845 is going to be the first to have a sensor that soaks up 64 times the color data compared to standard sensors, going from 8 bits to 10 bits of color. It's that bit depth that gives HDR content its 'pop', and you'll be able to see the difference for yourself in 2018. Qualcomm says it has substantially improved its algorithms, and added multi-frame noise reduction and video at 720 in HD10 for 480 frames per second for slow-motion video. ImMotion, something we haven't seen before, will allow future smartphone cameras to capture a mix of moving video and pause portions of the scene. Qualcomm illustrated this with a motionless girl staring at her goldfish that's moving about a bowl. The user will be able to edit these scenes thanks to new post-processing powers. There are already smartphone screens that can show HDR Premium content, which, given the size of a smartphone screen, is more important than the jump to a 4K resolution. We don't need more pixels, we need better-looking pixels. Here's the good news: you don't have to look far to find a device with an HDR-ready display – the LG G6, LG V30, Google Pixel 2 XL, S8, S8 Plus, and Samsung Galaxy Note 8 are all fine candidates. Here's the bad news: even if you're recording video in 4K, you've been recording video without HDR up to this point. So you haven't been been able to make full use of your phones top-end HDR display if it has one. The fix comes this year, however. A huge wave of HDR content is about to wash over the internet, changing both the ways in which people can capture HDR video and view it. The best part is that all of those older devices with HDR displays will be dazzled by your stunning HDR video. It's like the Snapdragon 845 is unlocking a dormant power. Expect friends with last year's flagship handsets to have instant phone envy when they see your HDR videos on YouTube and Facebook. What else can the Snapdragon 845 do? You can also expect power advancements and battery-life savings from the new chipset. The uncanny thing about new, more powerful processors is that they often drain your battery less quickly, and the Snapdragon 845 will be no different. Its QuickCharge 4+ capabilities will be able to juice-up your phone more quickly, too, giving you five hours of battery life from a mere five minutes of charging. That's not something benchmarking apps take into account. Additionally, the chip enables high-resolution depth-sensing in the cameras it powers, offering a three-fold performance boost in graphics compared to last year's phones – yet it will be 30% more power efficient. That's a big deal for Augmented Reality and Virtual Reality. It's all part of Qualcomm's chipset plans, which come down to five pillars: immersion, AI, security, connectivity and performance. Many of those go beyond the headline benchmarking scores above, and there's certainly more to come as we test out the first Snapdragon 845 phones. We'll have more on the Snapdragon 845 in the coming weeks, in the lead-up to the Samsung Galaxy S9 and S9 Plus launch event on February 25.